If you go to a wedding show and do simply do what everyone else does, you’re not going to stand out. That’s how you blend in. That kind of defeats the purpose, right? WARNING: if you really want to get noticed, it means being different. It means taking a chance on something that might not work and it feels risky. Playing it safe is actually risky because you’ll never, ever stand out. If you’re ready to step it up a notch, try on these strategies — or better yet, make them your own. #1 – Showcase an outrageous image at your booth. One photographer who is particularly cheeky would blow up one outrageous image to feature at his booth every year. His goal: be SO different that it gets tongues wagging. The first year: a (male!) poodle in a wedding gown. The second year: a bride in Central Park surrounded by men in speedos. I personally attended a bridal show where a photographer prominently displayed a gorgeous photo of a naked pregnant woman. People notice and remember them. FYI – you don’t need to be a photographer to show off an outrageous image, either. #2 – Give away prizes with dramatic flair. People LOVE winning stuff! There’s something even more exciting about winning when luck or chance is involved. That’s why people are addicted to the lottery. You can tap into this excitement right at your bridal show booth. Host a Wheel of Prizes. Construct a giant wheel couples can spin to get a prize. You might even partner up with other wedding businesses to provide some great goodies. This generates excitement and attracts people to your booth. Make sure your prizes are valuable to the couple, but not too costly for you. #3 – Become a wedding journalist. A wedding show offers an unparalleled opportunity for networking. Show up early and take advantage of it! One of the coolest strategies: record a short video interview with vendors right at their booths to collect their best tips. After the show, turn each video into a blog post, YouTube or free report. Promote this to your audience and share the link with your interviewees so they can spread the word. This is what we call a “Triple Threat” marketing strategy because it combines networking, website and social media in one power punch. #4 – Collect leads by text. Invite couples to text “wedding” to a number in order to enter a grand prize giveaway. Display your content and text-to-win number on a large sign, and have it announced by the MC of the bridal fashion show, if possible. This allows you to capture the mobile phone number of couples at the show and communicate with them via text. Get more details about how this strategy works here. If you’re doing a show, do it right. Borrow one of these strategies, embellish and make it your own. Your goal: stand out, get leads and get booked. 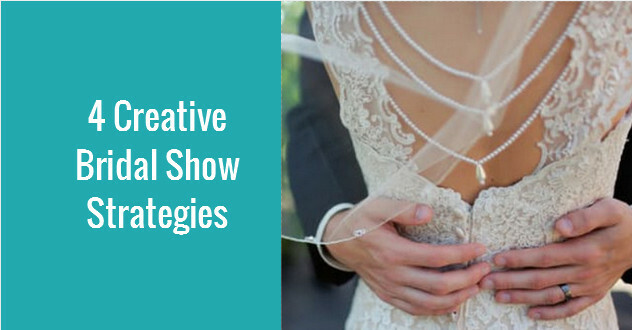 Create a strategy that works to book those weddings, and don’t forget to follow up after the show! What’s your most successful strategy for wedding shows? Great points , thank you sharing , nice blogs.